These instructions represent what I actually do to make the challot, as opposed to what the cookbooks usually say. I've streamlined the process for my own needs, based on the tools I own. Your mileage may vary. I buy the yeast in bulk at Costco for $2.99/2 lbs. This amount usually last me for many months of constant baking. I keep it in a glass container in the refrigerator, with a dedicated coffee scoop (2 Tablespoons) kept in the container. Most recipes call for one "packet" of yeast. One packet is just under one tablespoon. I always round up, most times doubling, the amount of yeast suggested in recipes. It doesn't discernibly change the flavor, and it makes the dough rise more reliably and faster. Be sure to add the yeast to the water, not vice-versa. 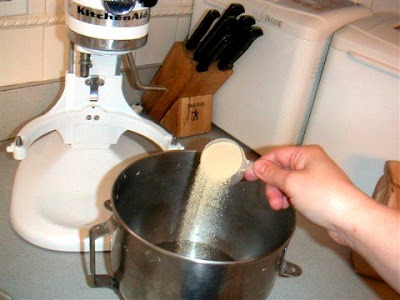 This will prevent yeast clumps and the yeast will dissolve faster.